It’s still Fall, right? We aren’t having to mow the lawn as often, and the leaves on my fruit trees are starting to turn beautiful colors of gold and red. 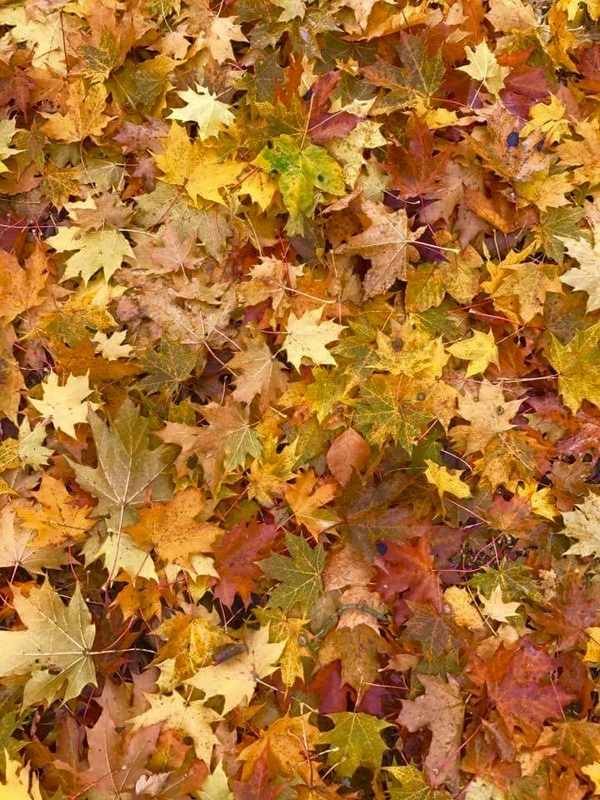 It won’t be long before there is a beautiful carpet of them on the lawn, and my sweet husband is cursing them as he scoops them out of the swimming pool. It’s not quite cool enough where I live to don a scarf or boots, but I already have the straw bales, pumpkins, and various other fall décor out on the porch and stretched across the mantle above the fireplace. I love that I can intermingle Halloween décor during the month of October, and then just remove the spiders, bats, and witches and be ready for November! California Girl Comments: I love fall, it is my favorite time of year! 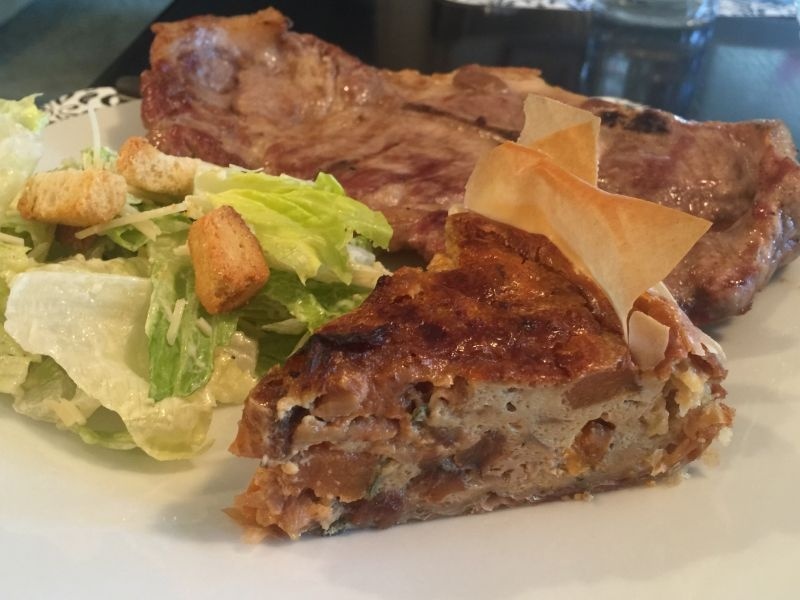 I love the recipes the leaves the crisp air and the wine! Yay for fall! 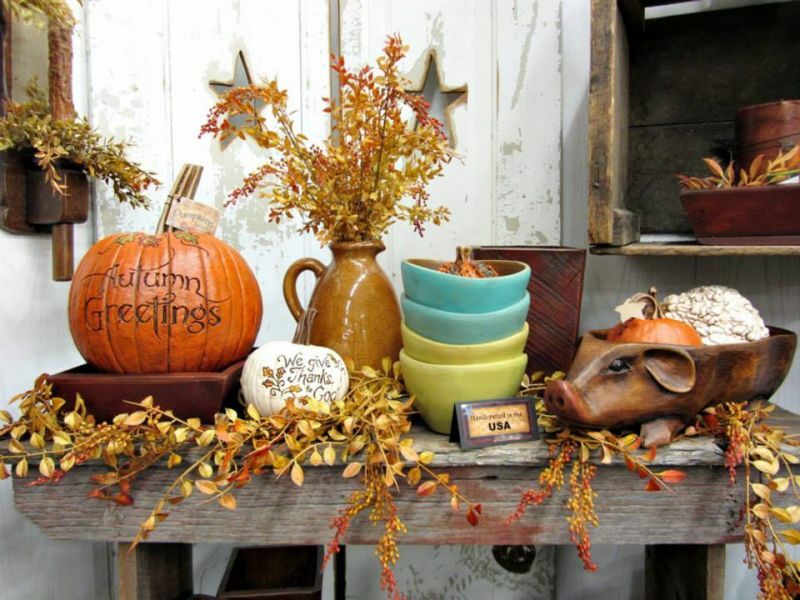 Regardless of the décor, September through November is squash and pumpkin season at our house! 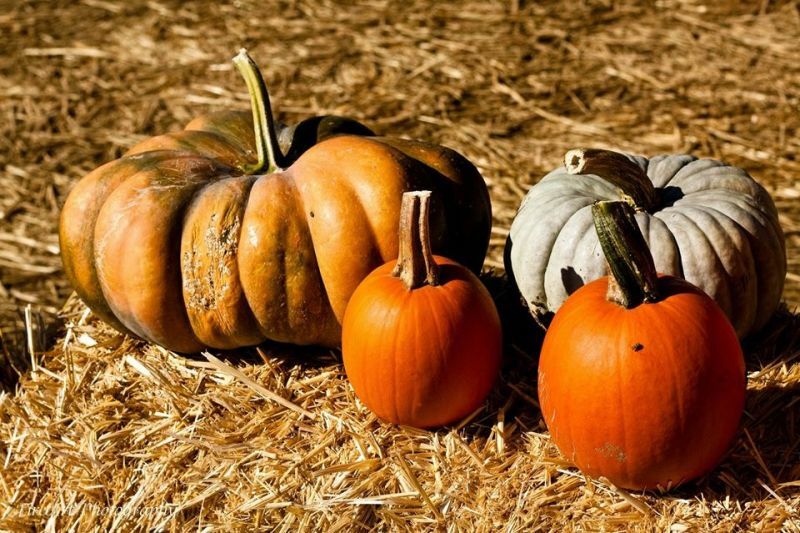 Pumpkin cookies, casseroles, quiches, desserts….my poor family gets “pumpkin’d out” by the time December first rolls around! So I bet today you are expecting a pumpkin dish, with an intro like that, right? Well, it’s not. 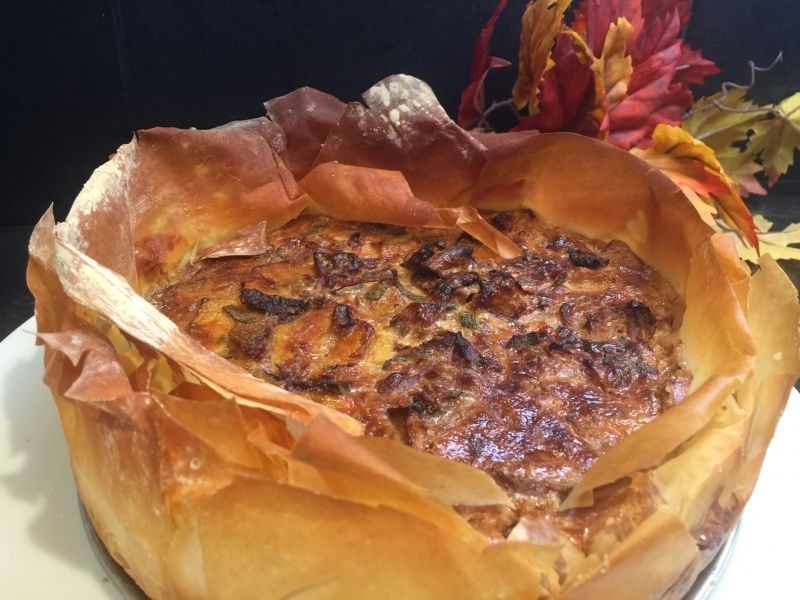 It’s a winter squash quiche-like you have never tasted. 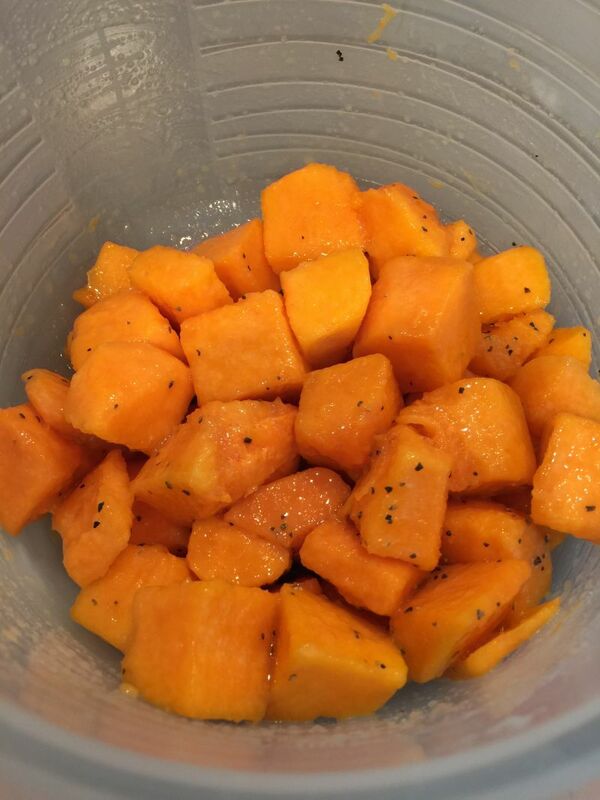 However, you can substitute cubed pumpkin in it instead and it is to die for! So, either way, you have a wonderful autumn dish that is a great side dish to a nice BBQ steak or served as an entrée with a side salad. You can use a 9-inch pie pan for this recipe, but I like to make it in a springform pan because it makes a more dramatic presentation. If you have one, give it a try! I originally got the “bones” for this recipe years ago from Kevin Lynch/Closet Cooking, but have since tweaked it to become more my own taste. I hope you enjoy. 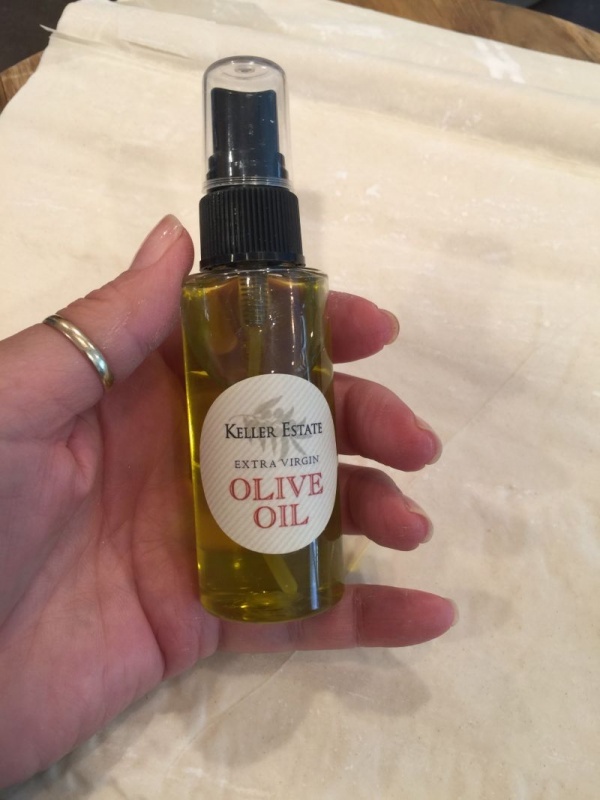 California Girl Comments: This particular Olive Oil came from Keller Estate Winery in Petaluma Gap. They gave it to us to try and it is wonderful! It is fun to be able to highlight it in one of our recipes. You can purchase their organic craft olive oils here. 1. Clean and slice the onion into very thin slices. 2. 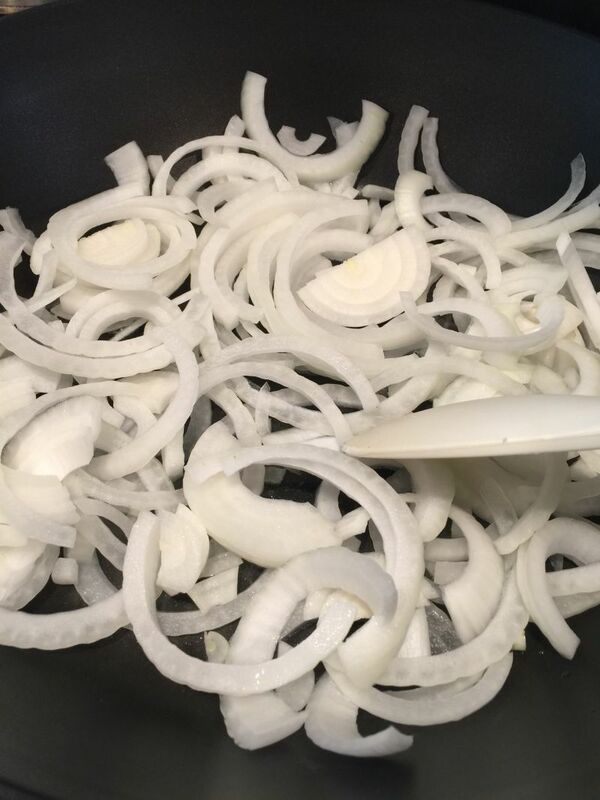 Over medium heat place a tablespoon of olive oil in a large pan, add the sliced onions and cook them for about 10 minutes, stirring frequently, until they are tender and slightly browned. Reduce the heat and add about 1/3 cup of water and cover with a lid. Stir every 10 minutes, and add a little water if the onions get dry. 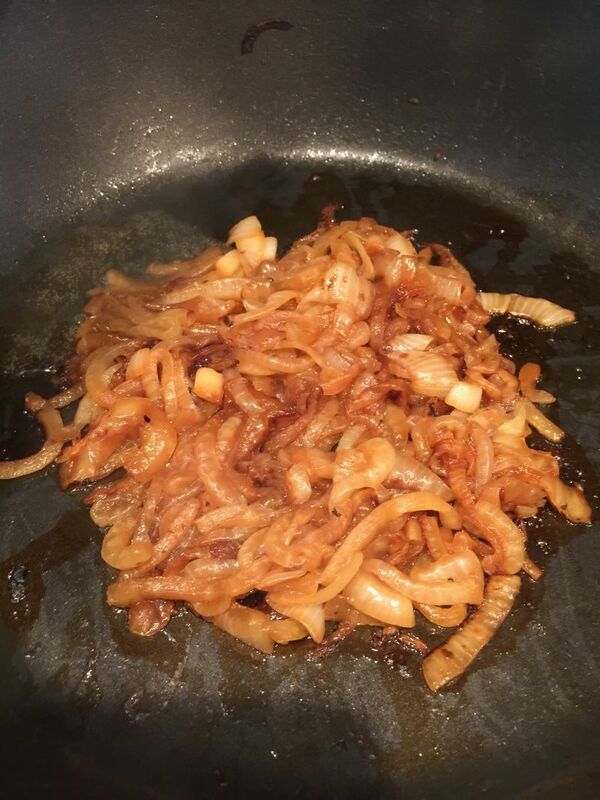 Cook this way for about 40 minutes or until the onions are a deep golden brown. 3. Skin and cube the butternut squash, making sure the cubes are small and bite size. Toss in a bowl with about 2 TBSP of olive oil, the salt, and pepper, and stir to evenly coat. 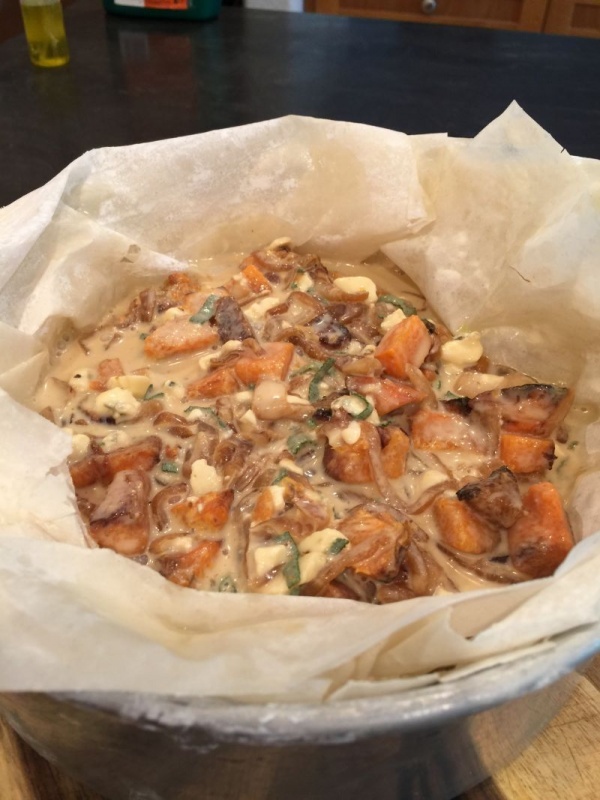 Place in a roasting pan and roast at 350degrees for 35-40 minutes. When done, set aside. 4. Spray a 9-inch pie pan, or a springform pan with non-stick spray, or rub down with olive oil. 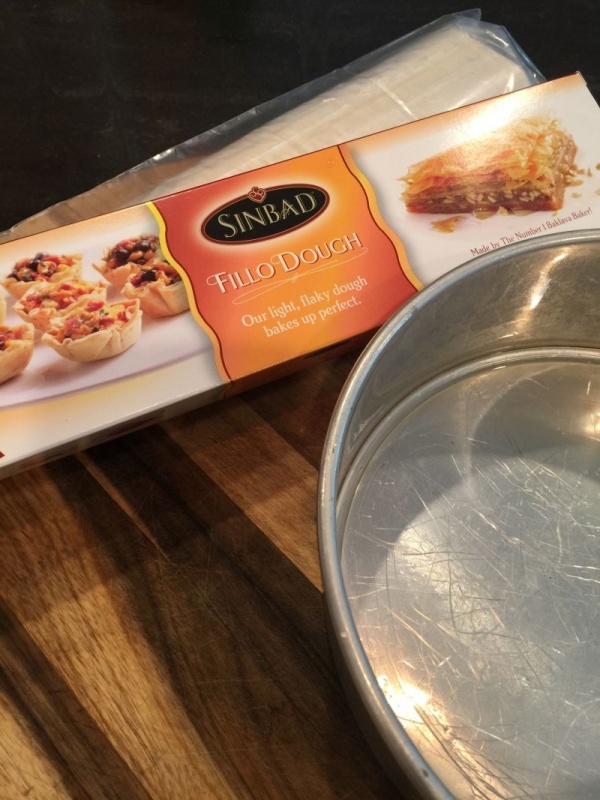 Spray or brush olive oil lightly on the phyllo dough sheets and lay one at a time into the pan, allowing the edges to come over the top of the pan a bit. 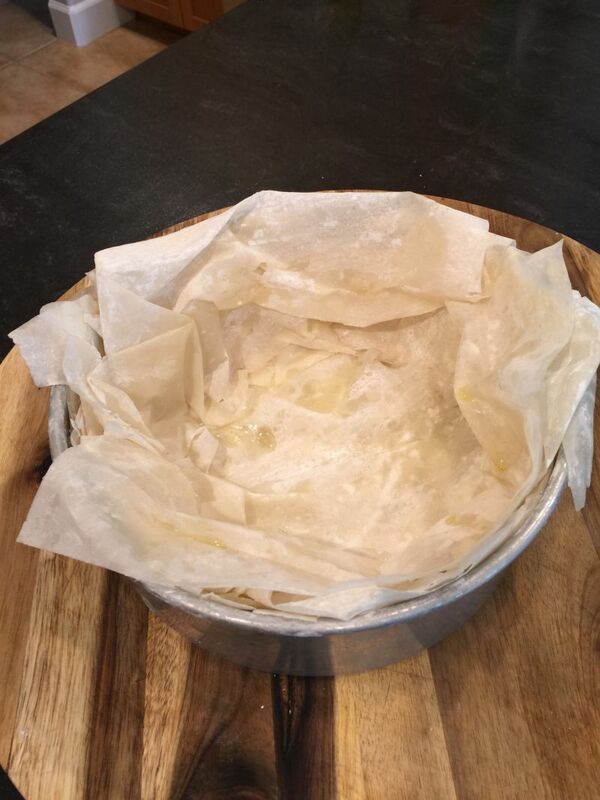 The dough will tear because it is fragile, but just move it around and put in place. Repeat 8 times, changing the position of the sheets to make sure everything is covered evenly. It will look crumpled and messy, but don’t worry. 5. 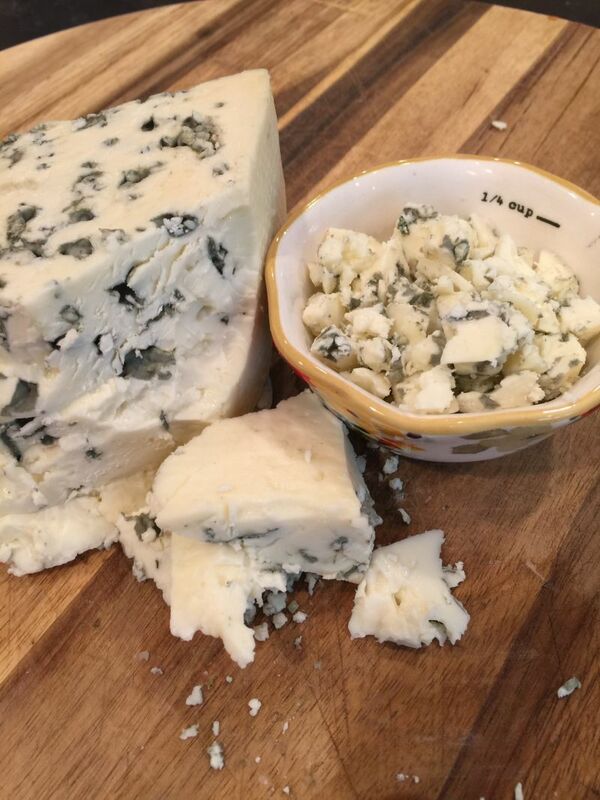 In a bowl, gently mix together the cooked onions, roasted squash, eggs, heavy cream, blue cheese crumbles and sage. 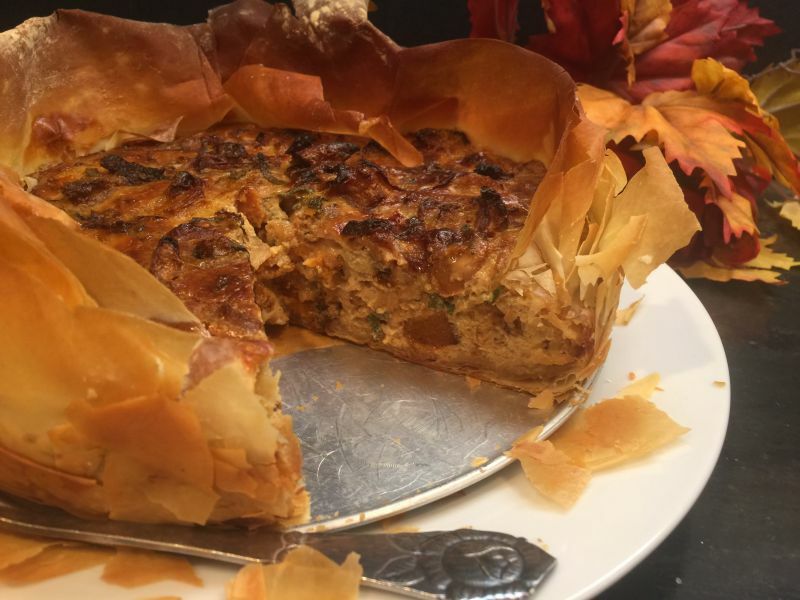 Pour into your prepared pan with the phyllo crust. 6. Bake at 375 degrees for 30-40 minutes or until golden brown. 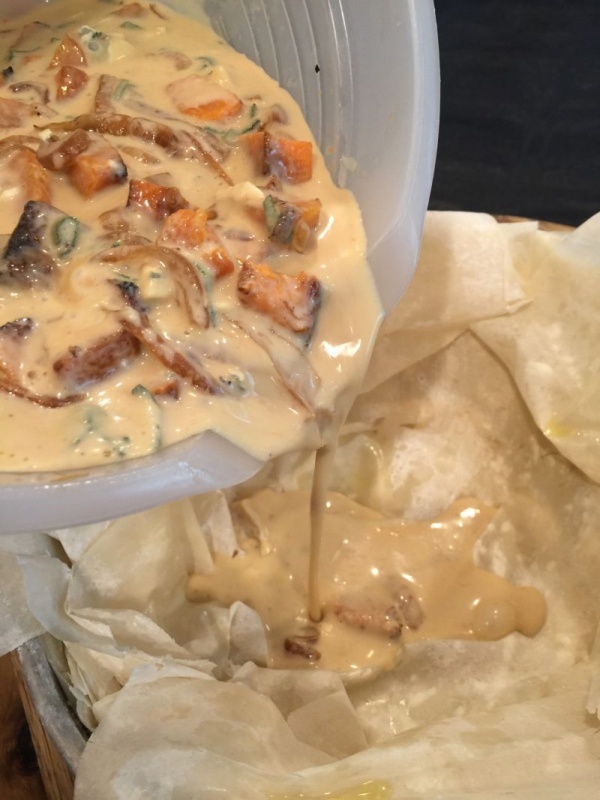 Allow to cool slightly before cutting, and serve in wedges. **now I have a little tip for you. It seems silly to go buy a bunch of fresh sage and only use a tablespoon of it, so this is what I do. (Take a look at the picture). 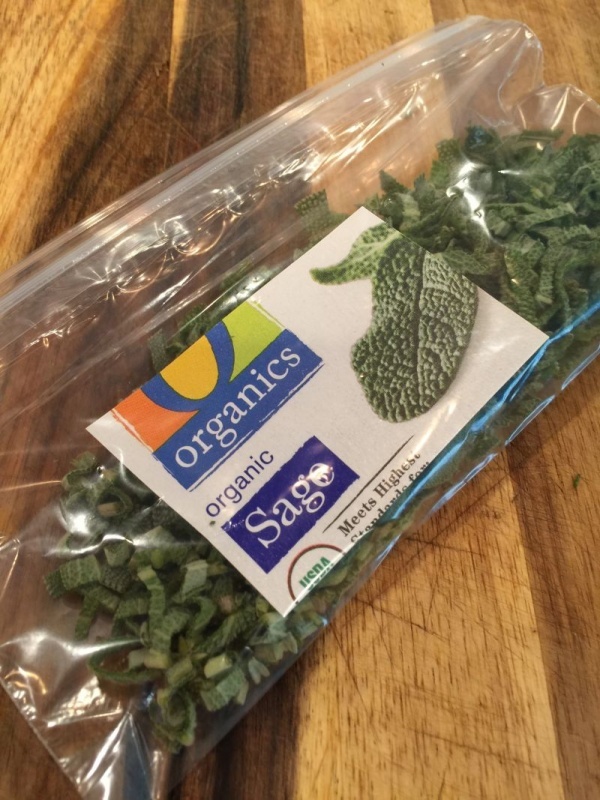 I cut the entire amount of sage into thin strips, place in a snack sized zip lock bag, and include the label from the container, which I have cut down to fit in the bag. Then I store it in the freezer. 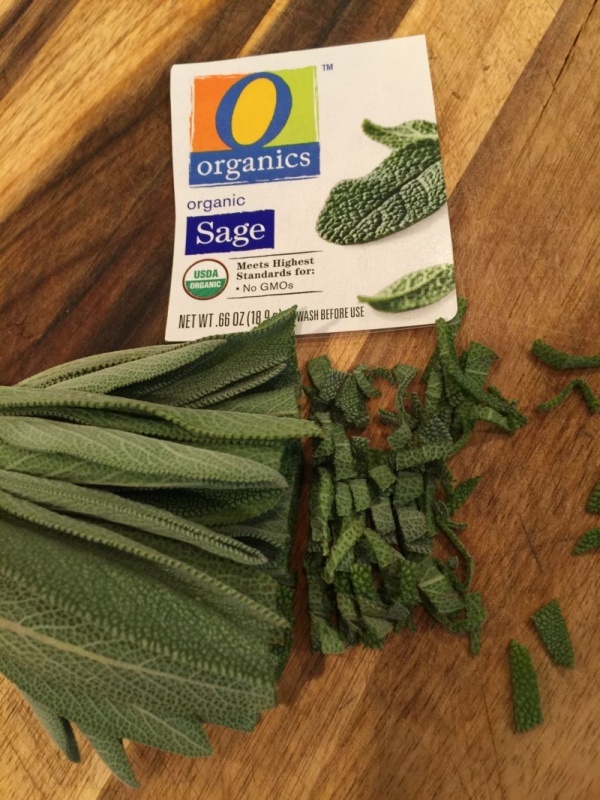 Now, I have cut fresh sage anytime I need it in a recipe. I do this for other fresh herbs as well, when I don’t have a fresh supply in the garden. Have a wonderful week! I would love to see pictures of your efforts–just include them in your comments in the blog! This is so delicious! California Girl Comments: Since we got our Olive oil from our friends at Keller Estate I thought I would offer a pairing from them as well. Good timing as I just got an email from them that they have a deal on shipping! I think this dish would be wonderful with their La Cruz Chardonnay. You can’t buy it in stores, but they will ship it to you $39.00. Its notes of creamy vanilla, apple, and lush tropical fruits would be a great compliment to this dish. Wow! Not only is this dish absolutely stunning but it sounds delicious. I think I will be trying this before the Fall season is over. Thank you for sharing it with us!